Fall Pet Safety Tips: And Adorable Pet Pictures! *** I received a complimentary week of the Blue Apron meal service in exchange for my honest thoughts in this series. Regardless, all photos below are original content, and all opinions are unaltered. Momma Told Me: I don't run a farm- we cook with what I can get. Growing up, one of Momma and I's favorite pastimes included combing the FOOD Network, and other such channels for late night and early morning runs of cooking shows like Iron Chef. This was 'back in the day,' when the only Iron Chef was the original 1993 Japanese, dubbed, series. There was a flamboyant chairman in Liberace style suits, sassy 'celebrity' judges (which mainly consisted of daytime soap stars), and a plethora of ingredients my little American culinary mind had never even heard of before. We'd sit there making fun of the poor quality dub, criticizing chefs that were clearly talented far beyond out skills, and fantasize about the dishes we'd make if we were in that Kitchen Stadium. Through the years, and especially when American chefs began making guest appearances (Bobby Flay), Momma would often remark from time to time, "I could make that- if I only had the ingredients!" Now, where on Earth she would have found Wild Boar, Freshwater Eel, and Mochi to make those dishes, I have no idea. I share this tale because most foodies have a desire to not only taste the delicacies they come across, but to learn to reproduce them as well. For me, cooking is much more than getting food on the table. Yes, I still rely on Hamburger Helper and cooking sauces to get me through the busy nights; but I really long to be in the kitchen working with fresh ingredients. Cooking, for me, is an immersive experience, from mastering skills to the sights, textures, and smells of an active kitchen. The very feel of the wood beneath my knife on the cutting board, or the satisfaction of a freshly cored pepper, these are experiences that truly get my palette excited. Which is why I immediately fell in love with the concept of Blue Apron; all the ingredients you need to cook a meal, plus the confidence of step by step instruction. I introduced the Blue Apron program to you all last weekend, with the Stuffed Peppers and Millet recipe, I'd tackled first. You may recall that I am not a big ground beef fan, nor have I ever attempted to stuff a pepper- but the 'experiment' was a rousing success with Blue Apron's full color ingredient and instruction recipe card, as well as perfectly portioned, fresh, ingredients. Calories per serving, and references for additional online content (recipe videos and customer submitted tips) enhanced the experience further with all the confidence I needed to tackle a brand new recipe. And the results were delicious! Not only did my peppers turn out just as good as those on the Blue Apron website, but the sense of accomplishment I felt was amazing. 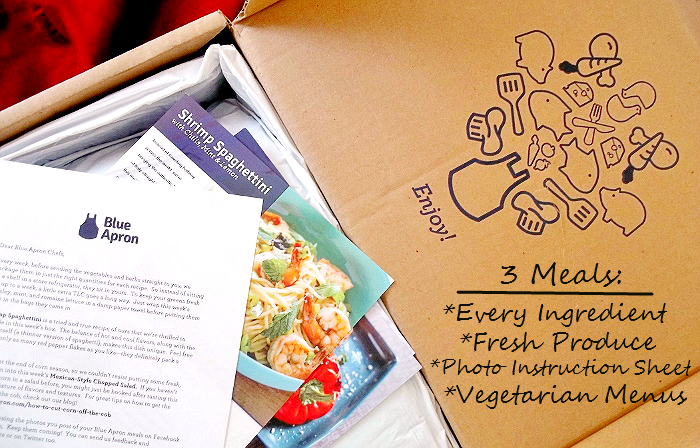 Blue Apron currently only offers a 3 meal per week plan, that is entirely elective for customers. You buy your box the week prior, when you will receive an email previewing the following weeks recipes. Each box comes standard with 2 servings (just under $10/person), though multiples of 2 servings may be added on at the same per meal cost. 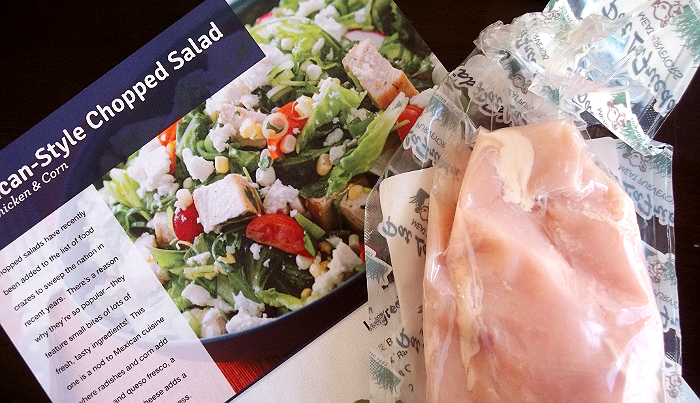 Blue Apron members can also access online content, such as past and current recipes, to play around with the featured meals at their own leisure. 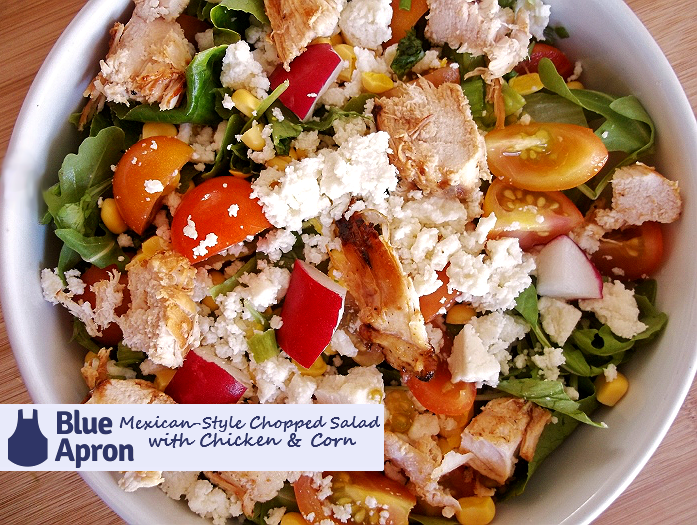 My second box recipe was a light and refreshing Mexican-Style Chopped Salad with chicken and corn. 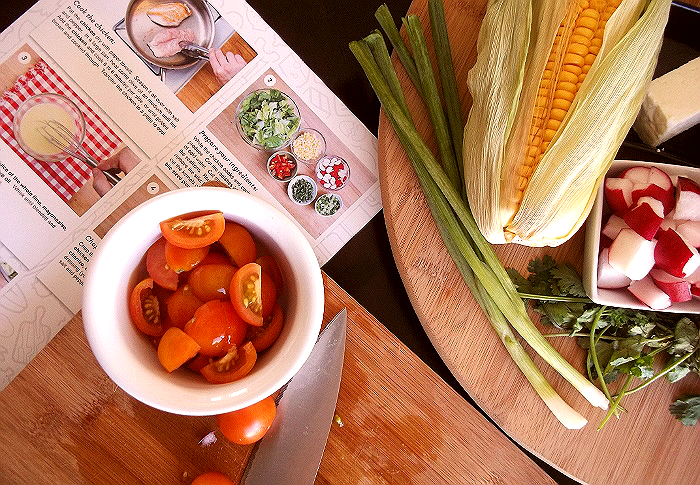 I learned how to corn a cob, and made a cold-serve meal with fresh Arugula, two new experiences for me. 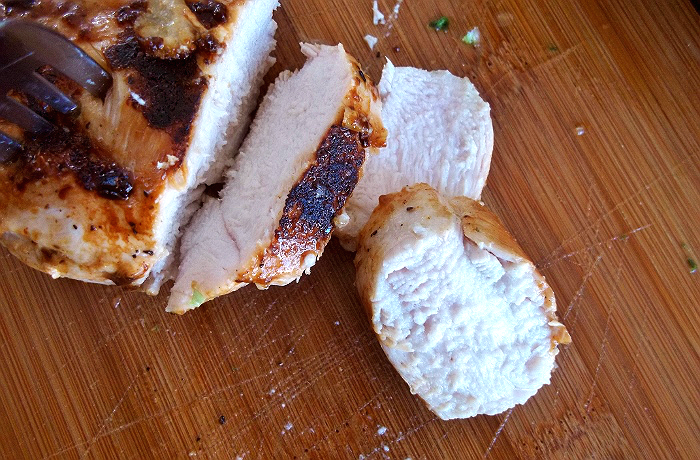 Thanks to the guided instructions, I was able to cook my chicken breasts while preparing my fresh ingredients, so the total prep time was just under 15 minutes. 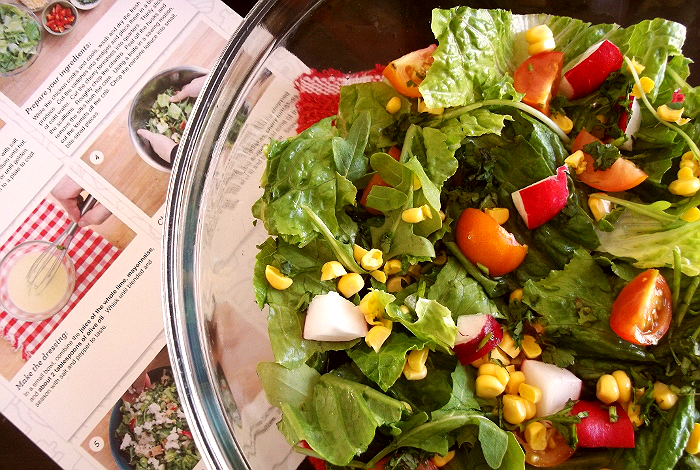 The Mexican-Style Chopped Salad was a big hit, featuring corn and freshly crumbled Queso Freso, though the Lime and Mayonnaise dressing didn't go over as well. We opted for a fresh vinaigrette instead. The salad was delicious, and surprisingly hearty with the myriad of colorful ingredients inside. The portions on this meal seemed more than generous, and we actually had an entire serving leftover for dinner that evening. What I loved most? 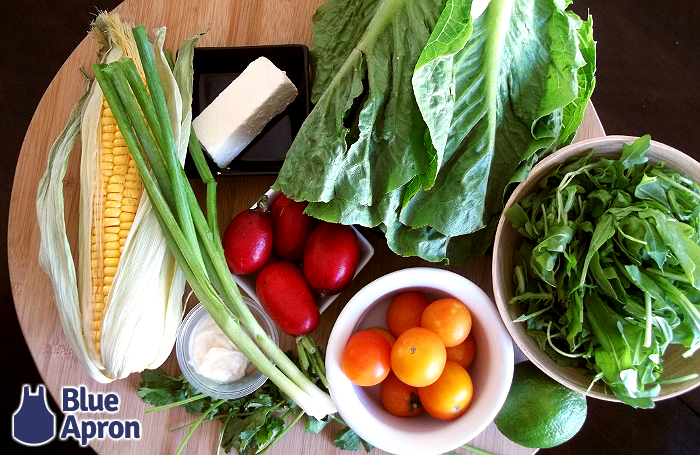 I didn't have to hunt down expensive fresh ingredients, and balance the shelf life of leftover greens during the week. There was absolutely no waste, and no footwork on my part. I got to experience a new recipe in the comfort of my home kitchen, without a frustrating and expensive grocery trip! What Daughter Says: Don't limit your culinary curiosity- Experience hand picked recipes and fresh ingredients, delivered to your door each week. Everything looks yummy. I love a good fresh salad. I really need to sign up for this service. I am always at a loss for new things to cook at home. Your photos and reviews are always so inspiring. that looks delicioso and easy to make! We cook with fresh ingredients but we make the same dishes because learning new recipes is near impossible with busy schedules. Time to shake things up! Thanks so much, I'm signing up! Wow, that really does look so delicious! Everything looks so health, plus super convenient!